In search of the best in BBQ restaurants, recipes, and sauces. 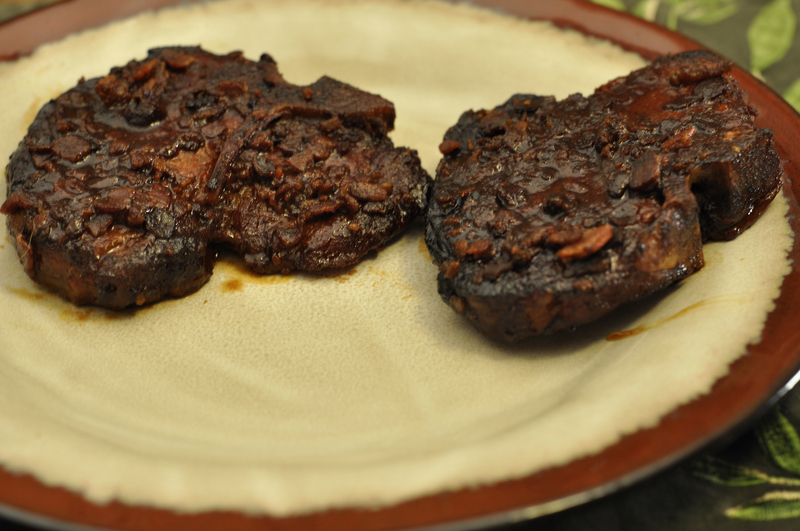 While making my bacon wrapped sweet potatoes I decided to use the left over bacon bits to add to my smoked pork chops. After the first layer of bbq sauce I just crumbled up the bacon on top and then added more sauce on top of that. The pork chops were pretty thin to be smoking and I didn’t decide until today that was what I was going to do with them so I didn’t brine them like I usually would a piece of pork this thin. Because of that they didn’t come out quite as juicy as I would have liked but they still tasted really good. I used root beer bbq sauce on this batch of chops. The wife wasn’t crazy about the sauce but she doesn’t love root beer like the boy and I do. That and she’s really spoiled.